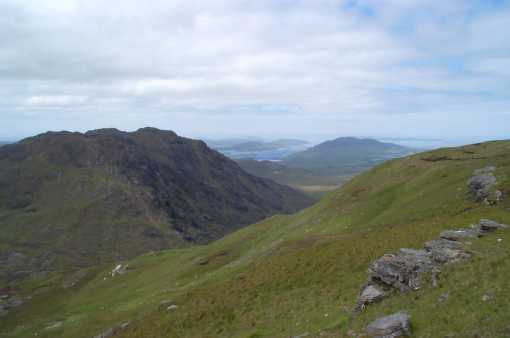 The townland south of this top, running down to Kylemore Lough, is Lemnaheltia (Ir. Léim na hEilte, 'the doe's leap'). It appears on Mercator's map of Ireland (1595) as Dosleape. This must originally have been the name of a mountain or cliff. According to legend Fionn Mac Cumhail's dog Bran pursued a doe here. When the doe leapt from the summit, Bran fell from the cliff into the lake. Most likely it refers to the steep south face of Doughruagh overlooking Kylemore Lough and Pollacappul Lough, though Doughruagh is not in Lemnaheltia but the neighbouring townland of Pollacappul. Variations of this story can be found throughout Ireland. In Kerry, for instance, there is a lake named Lough Brin (Ir. Loch Broin, 'Bran's lake') south of the Reeks. Previously Lemnaheltia in MV. Altnagaighera is the name of a spur to the W which is lower than Garraun South top but more sharply defined. Garraun South Top is the 400th highest place in Ireland.